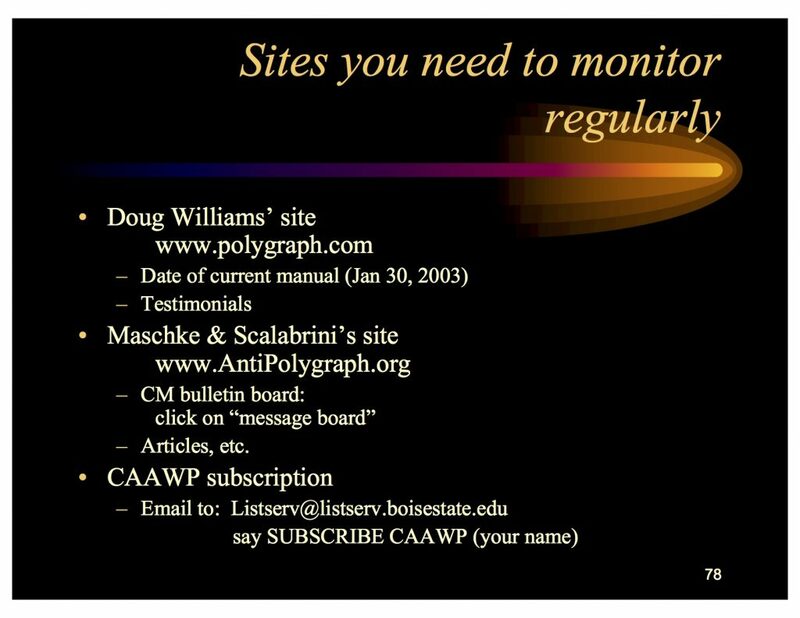 AntiPolygraph.org has obtained a copy of the 397-slide PowerPoint file Dr. Barland used in this presentation, which we are also making available as a PDF file. All are invited to download the file and to review it slide by slide. We present here only a few highlights. Barland goes on to discuss Williams’ manual, How to Sting the Polygraph, at length. 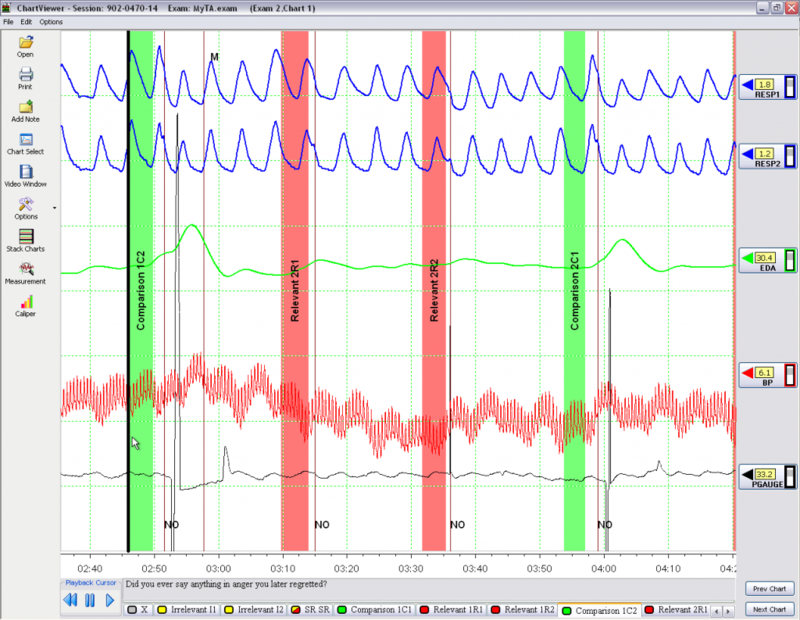 Numerous slides discuss conversations on the AntiPolygraph.org message board and the contents of The Lie Behind the Lie Detector. Absent from the presentation is any clearly stated, effective method for reliably detecting the kinds of countermeasures outlined in How to Sting the Polygraph and The Lie Behind the Lie Detector. 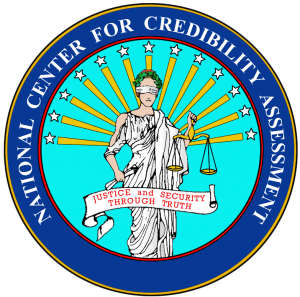 AntiPolygraph.org has received an archive of National Center for Credibility Assessment (NCCA) documents about polygraph countermeasures. We begin publication with an undated “white paper” titled “Timeline Detailing the Countermeasures Classification Issue” (288 kb PDF). Metadata in the Microsoft Word version (140 kb DOC) of the document indicates that it was created on 15 August 2012 by NCCA Quality Assurance Program chief Gary Light. 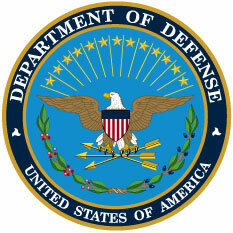 In January 2014, McClatchy investigative reporter Marisa Taylor reported on efforts by the Defense Intelligence Agency (DIA), NCCA’s parent agency since 2008, to classify certain information about polygraphy. (See AntiPolygraph.org’s commentary on her reporting here.) Gary Light’s white paper helps to shed light on the internal debate over whether information about polygraphy, including polygraph countermeasures, should be classified. Light appears to be firmly in the “no” camp. The white paper includes an appendix documenting the publication and presentation of information about polygraph countermeasures “in an unclassified environment,” including, among other things, a 2005 class taught by former NCCA (then DoDPI) researcher Charles R. Honts in the People’s Republic of China. Light also writes that “[i]t should be … noted that since 2000 the federal government has conducted over 1,000,000,000 [sic] examinations.” It seems likely that this is a typographical error, and that the actual number is an order of magnitude lower, or over 1,000,000 polygraph examinations conducted between 2000 and 2012. 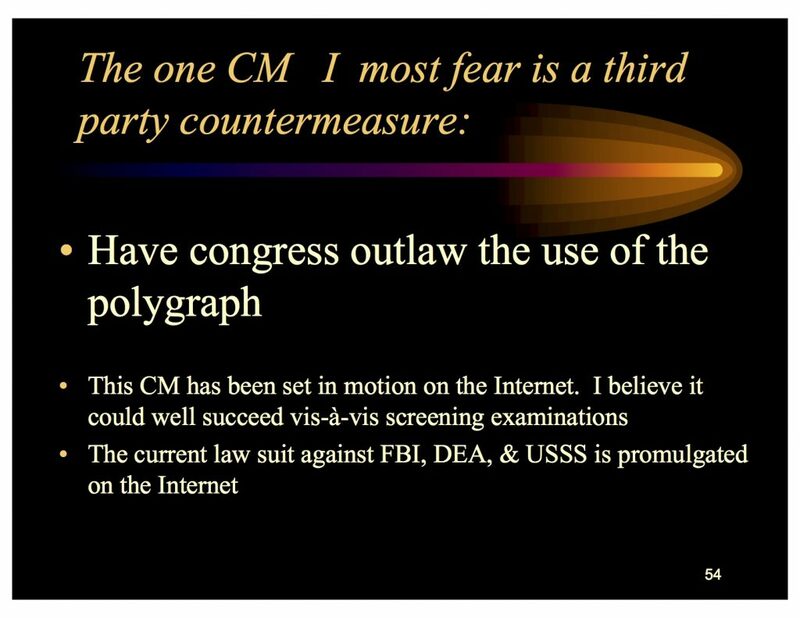 This would average out to about >83,300 polygraph examinations per year across the federal government during the relevant time period. According to Department of Defense (DoD) polygraph operator Brian R. Morris, DoD alone has been conducting more than 129,000 polygraphs per year in the aftermath of former NSA contractor Edward Snowden’s 2013 revelations. AntiPolygraph.org can attest that NCCA procedures for the protection of its polygraph countermeasure protocols have indeed failed. We have them and will be publishing them in due course. Watch this space. Note also retired DIA counterintelligence officer Scott W. Carmichael’s 2014 claim that the then number two official at NCCA, Donald Krapohl, violated the Espionage Act by funneling classified information about polygraph countermeasures to the government of Singapore. The United States government is so worked up about polygraph countermeasures that it launched an ongoing criminal investigation dubbed Operation Lie Busters targeting individuals who teach others how to pass or beat polygraph examinations. An Indiana electrician named Chad Dixon who taught people how to pass the polygraph as a side job was sentenced to eight months in federal prison, and former police polygraphist Doug Williams, who operates the website Polygraph.com, was raided by federal agents who seized his customer records. At the time of this writing, he has not been charged with any crime but remains in legal jeopardy. Federal investigators created and circulated a watch list based on Dixon’s and Williams’ customer records. 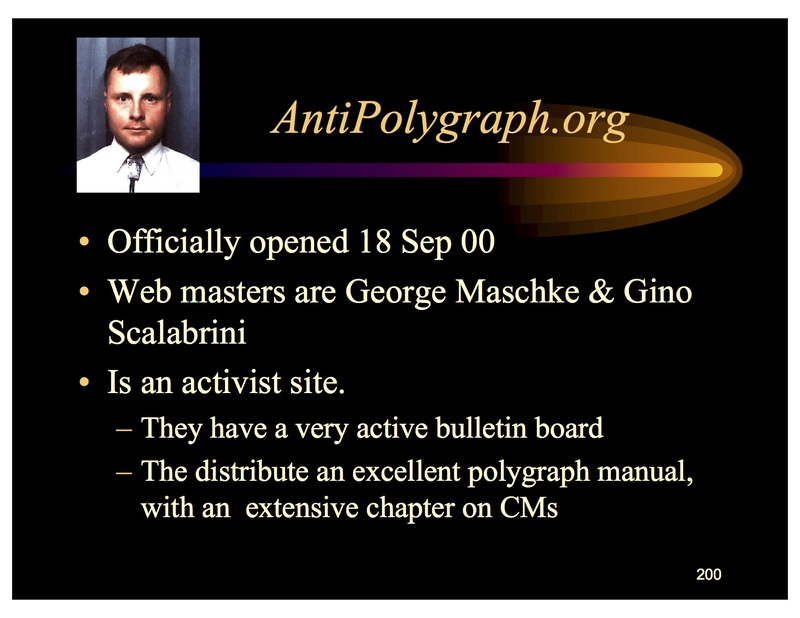 AntiPolygraph.org co-founder George Maschke appears to have been the target of an attempted entrapment as well, and evidence suggests that the U.S. government may be monitoring visitors to this site. 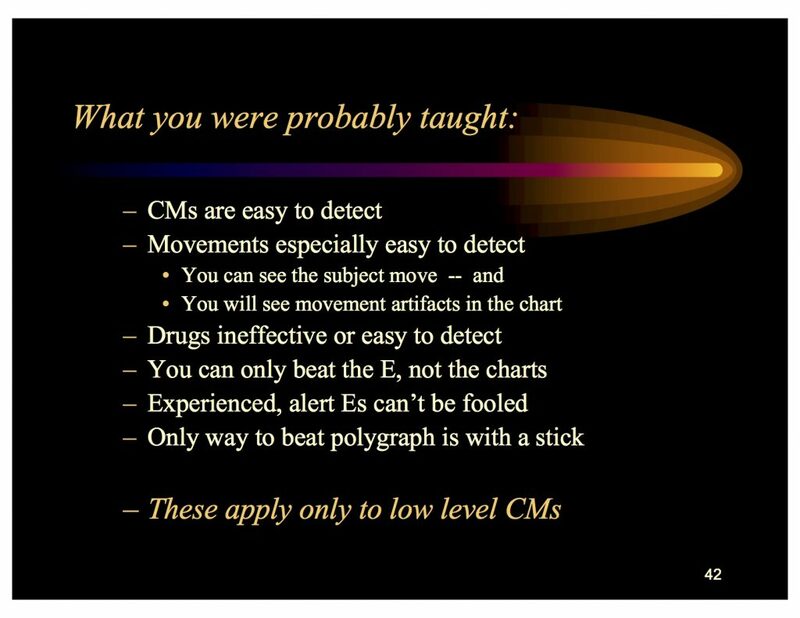 Polygraphers often claim that they can reliably detect the kinds of countermeasures outlined in AntiPolygraph.org’s free book, The Lie Behind the Lie Detector (1 mb PDF) and in Williams’ manual, “How to Sting the Polygraph.” Yet no polygrapher has ever demonstrated such an ability, and polygraph community documentation obtained by AntiPolygraph.org strongly suggests that polygraphers have no reliable methodology for detecting them. Confessions to countermeasure use are relatively rare, and when they occur, at least some federal agencies send case information, stripped of the examinee’s personal details, to the federal polygraph school, the National Center for Credibility Assessment, for study. 7. (U//FOUO) OTHER REPORTABLE INFORMATION: During the conduct of testing EXAMINEE exhibited atypical physiological responses, indicative of the use of countermeasures (CM). During post-test questioning, EXAMINEE admitted to altering HIS breathing during the initial phase of collection of polygraph charts. 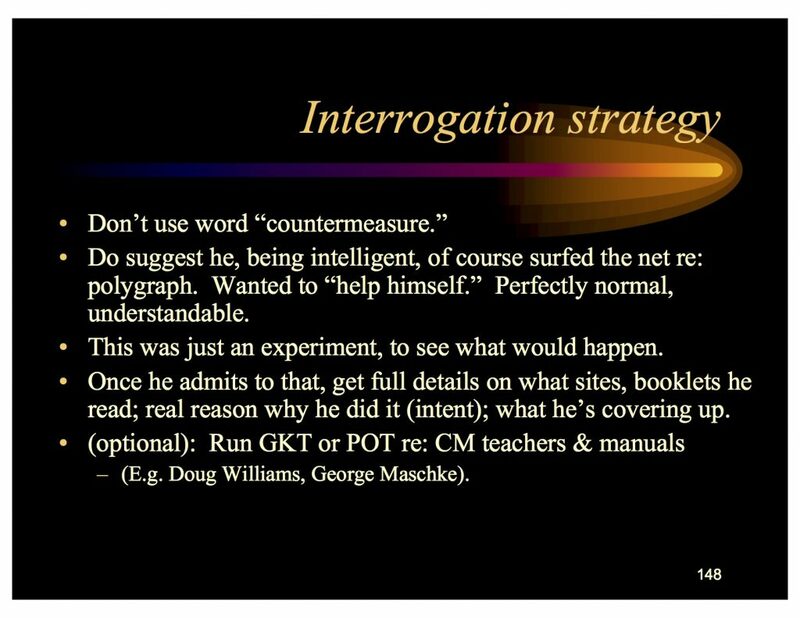 EXAMINEE stated that prior to the polygraph session, HE researched polygraph via internet searches using the keywords “polygraph”, CIA polygraph”, full scope polygraph” and “polygraph truth”. EXAMINEE recalled HE read a DOD-sponsored site and watched a video designed to inform readers about the polygraph process and of [sic] the website “Antipolygraph.org”. EXAMINEE related HE did not employ any physical countermeasures outlined in the web searches, such as pressing HIS toes or using a small stone or tack in HIS shoe. EXAMINEE related HE focused on changing HIS breathing during questions where HE wanted to create a clear response. EXAMINEE stated HE talked to co-workers about polygraph and was advised to relax and be honest. EXAMINEE stated HE felt the need to exaggerate HIS responses as HE was unsure of the sensitivity of the instrumentation. EXAMINEE executed a sworn, written statement, detailing the information. Touhey’s report includes a hand-written statement by the examinee, a government contractor employed by the Tatitlek Corporation, that is consonant with the above summation. Extract from examinee’s first chart. This, and not any breathing irregularity, is what alerted the polygraph examiner that the examinee was attempting countermeasures. It explains why Touhey asked the examinee about toe-pressing. But note that AntiPolygraph.org specifically advises against this kind of countermeasure. Indeed, none of the suggested countermeasures in The Lie Behind the Lie Detector would produce the kind of spikes observed on the countermeasure tracing here. AntiPolygraph.org has also received a copy of an “INSCOM Polygraph Countermeasures Report” (46 kb PDF) associated with this case. Despite the fact that, as discussed above, the examinee employed countermeasures that AntiPolygraph.org specifically advises against, Touhey reports that the examinee received his countermeasure information from AntiPolygraph.org. The countermeasures report further notes that “EXAMINEE was re-tested the same day with favorable results.” AntiPolygraph.org co-founder George Maschke’s pre 9/11 observation that the key to passing the DoD counterintelligence-scope polygraph is evidently to make no substantive admissions may still hold true today. Federal officials are deluding themselves if they think they can detect the kinds of countermeasures documented on AntiPolygraph.org based on examples like the above case. Well-trained spies, saboteurs, and terrorists who understand polygraph procedure will not make the rookie mistake that the examinee in this case made. AntiPolygraph.org makes information about polygraph countermeasures available to afford truthful persons a means of protecting themselves against the random error that is all too common in polygraph screening. But inevitably, the same techniques can also be used by those working against the United States (as happened in the case of Ana Belen Montes, a Cuban double agent trained in polygraph countermeasures who penetrated the Defense Intelligence Agency while passing her polygraph examinations “with flying colors”). Instead of trying to criminalize the dissemination of information about polygraph countermeasures, the U.S. government should heed the warning of the National Research Council that “[polygraph testing’s] accuracy in distinguishing actual or potential security violators from innocent test takers is insufficient to justify reliance on its use in employee security screening in federal agencies.” Polygraphy must be abolished. 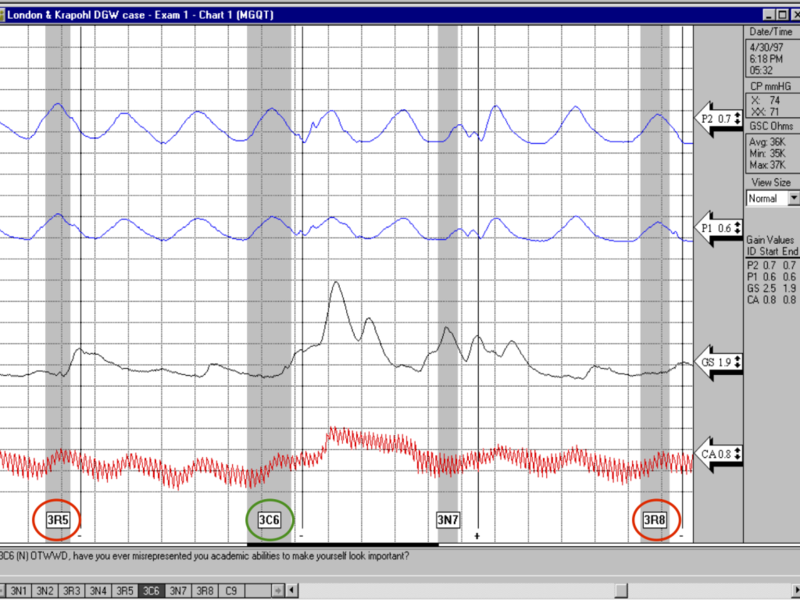 Prior to my examination, I visited some websites both pro + con relating to the polygraph process. I did so to gather information so I could feel comfortable during my first exam. I performed primarily “Google” searches on terms: Polygraph, CI Polygraph, Full Scope Polygraph, and Polygraph Truth. Specific sites I recall visiting were: DoD sponsored/[owned?] polygraph site + video, and polygraphtruth.org (I think). Mind you that many sites visited were google search results so I don’t specifically recall individual URLs…. 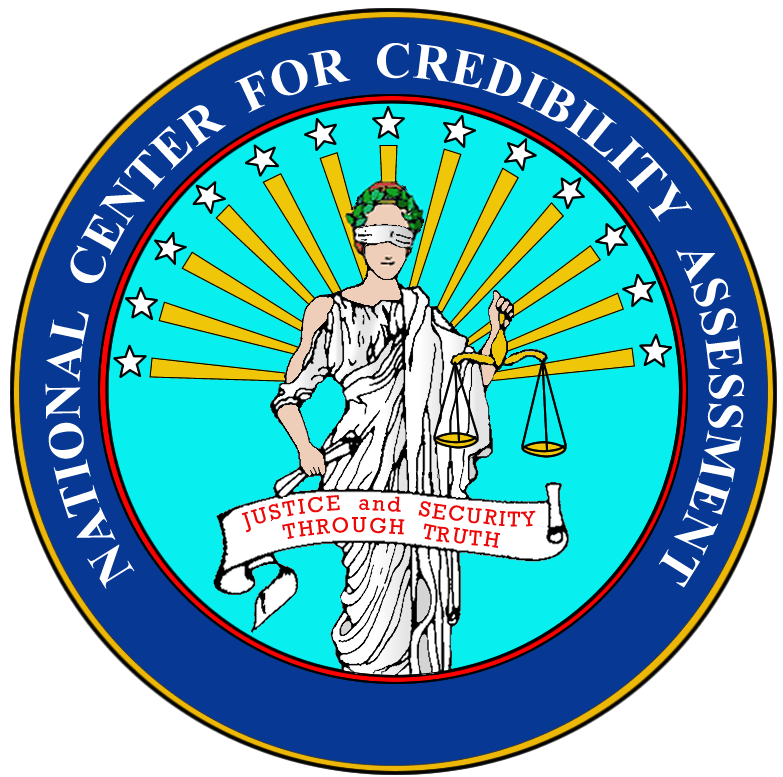 Coming on the heels of an accusation that a senior official at the National Center for Credibility Assessment (NCCA) facilitated the transfer of classified information to the government of Singapore via the Lafayette Instrument Company, AntiPolygraph.org has received information that NCCA has provided polygraph countermeasure documentation to a representative of Stoelting Co., another polygraph-manufacturing company. In 2004, Stoelting’s then CEO Lavern Miller pleaded guilty to attempting to export polygraph instruments to China without a license. Have you been offered any money to work for a foreign intelligence service? Have you secretly provided the [redacted] technology to any foreign government? Have you been directed to penetrate the CIA by any foreign intelligence service? Other than what we discussed, have you ever misrepresented you [sic] academic abilities to make yourself look important? Before joining the military, did you ever lie about anythig [sic] that you don’t want the CIA to find out about? and you have the key information required to successfully defeat such a polygraph examination. Polygraph examinations are not difficult to defeat, and it would be hard to credibly argue that public release of the information contained in the presentation will harm U.S. national security interests in any way. But this is the kind of information that NCCA’s parent agency, the Defense Intelligence Agency, would probably withhold from a member of the public who requested it under the Freedom of Information Act. Yet such things seemingly circulate among NCCA’s favored friends. 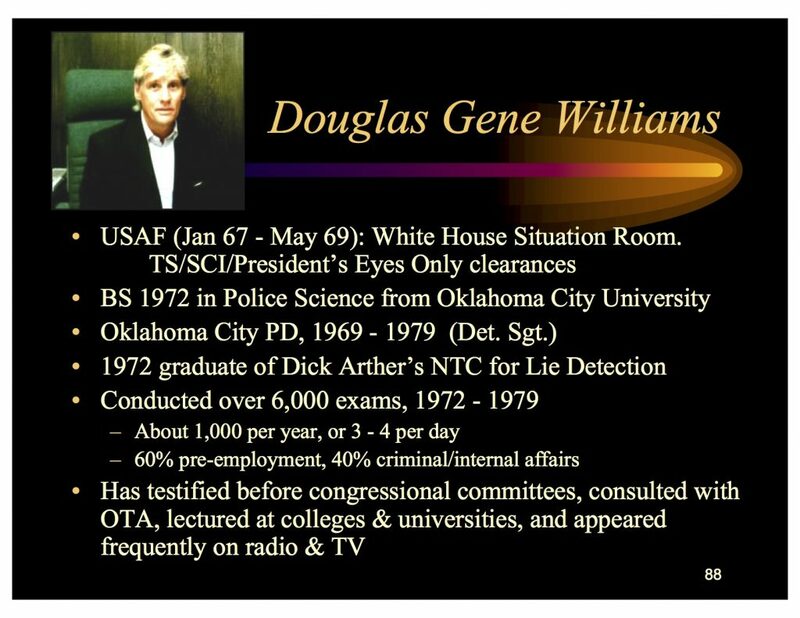 It’s worth noting that the examinee in the above case study had purchased Doug Williams’ manual, “How to Sting the Polygraph.” The CIA polygraph examiner suspected countermeasures because of the large size of a reaction, but was only able to confirm that countermeasures were employed because the examinee admitted such when asked. An in-depth discussion of this case may be found on the AntiPolygraph.org message board. Update: With respect to why a polygraph manufacturer might want NCCA training slides on countermeasures, note that as McClatchy reporter Marisa Taylor mentioned last year in her article, “Polygraph world’s close ties spark accusations of favoritism,” Stoelting Co. has purchased a polygraph school. While Stoelting refused comment to Taylor on this, it appears that the polygraph school Stoelting purchased is the Academy of Polygraph Science in Fort Myers, Florida. 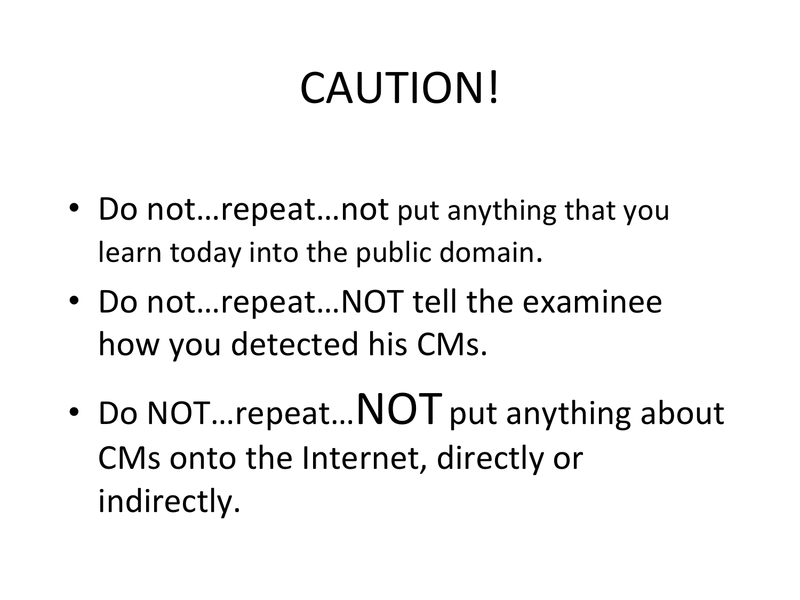 A 2013 presentation by the National Center for Credibility Assessment documents that the federal polygraph school is working on a computer software project intended to automate the detection of polygraph countermeasures. 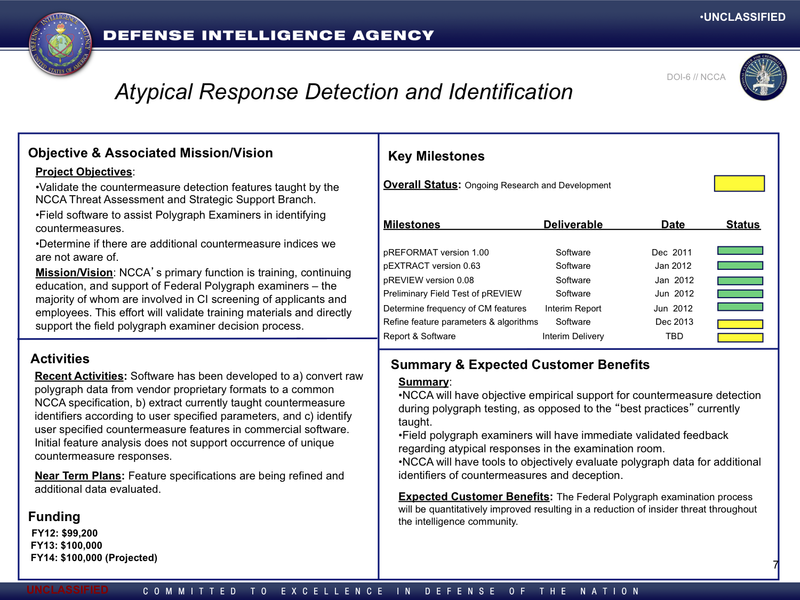 It appears that the software does not employ a new approach to countermeasure detection, but rather seeks to “[v]alidate the countermeasure detection features taught by the NCCA Threat Assessment and Strategic Support Branch.” A competent scientist might first attempt to determine whether such putative “countermeasure detection features” are indeed valid, rather than set out to “validate” them. NCCA seems not to allow for the possibility that any of their teachings might not be valid. To date, no polygrapher has ever demonstrated any ability to detect the kinds of countermeasures described in AntiPolygraph.org’s free book, The Lie Behind the Lie Detector or in former police polygraphist Doug Williams’ manual, “How to Sting the Polygraph” and documentation obtained by AntiPolygraph.org indicates that the polygraph community has no reliable method of detecting such countermeasures. The NCCA presentation projects that the countermeasures detection software project would be completed by the end of 2013 with a report and software to be delivered at a date that remained to be determined. The project had a budget of $199,200 in fiscal years 2012 and 2013, with another $100,000 projected for fiscal year 2014. 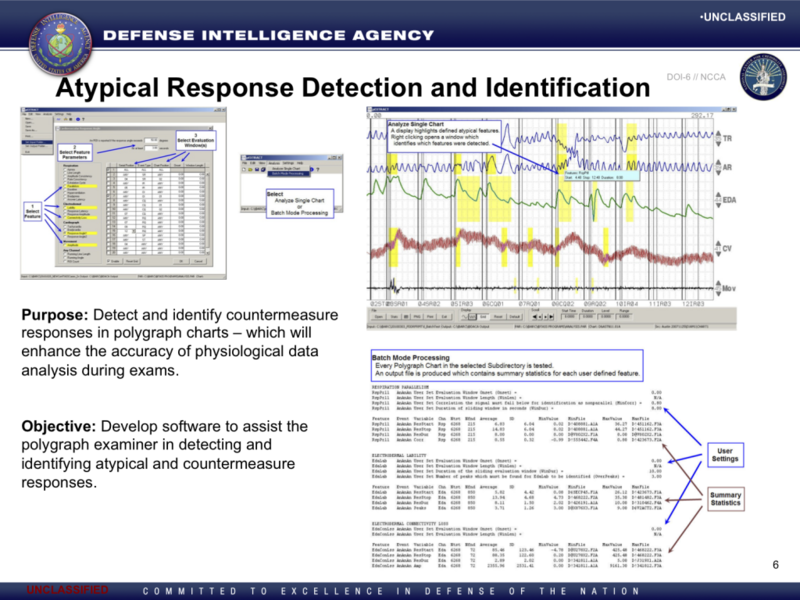 The slides from the presentation that deal with the countermeasure detection software are reproduced below. Among other things, the presentation indicates that NCCA has developed a “common NCCA specification” for polygraph chart data. To AntiPolygraph.org’s knowledge, such specification has not been publicly documented. New countermeasure detection methods developed through classified projects by the NCCA or other government entities. Disclosure that particular US intelligence, counterintelligence or security programs use a specific type of polygraph technique. NCCA research on new credibility assessment technologies and analytical methods to be used solely by intelligence or security agencies. Information deemed classified by any NCCA customer agency, irrespective of recognition by DoD as being classified. Research into new technologies designed for covert applications. 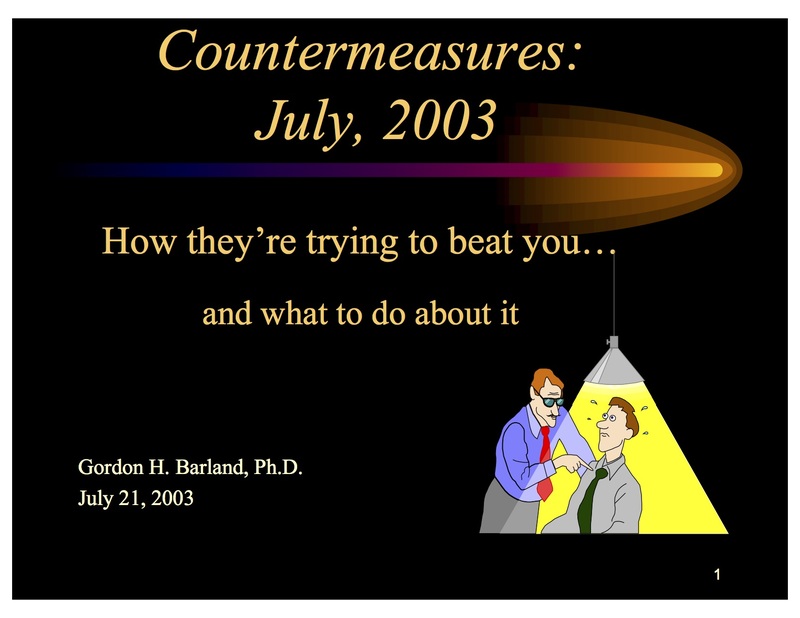 Methods for detecting and thwarting countermeasures. Research into new polygraph testing methods. Note that NCCA seems particularly keen on keeping anything about polygraph countermeasure detection a secret. Polygraph community documentation obtained by AntiPolygraph.org suggest that the polygraph community has no reliable methodology for detecting polygraph countermeasures, and that countermeasure “detection” consists largely of guesswork and badgering the examinee for an admission. Professor Charles R. Honts indicates that one supposed countermeasure detection technique used by the federal government is invalid. The technique involves looking for the breathing reactions illustrated in former police polygraphist Doug Williams’ manual, “How to Sting the Polygraph.” In a laboratory experiment, Honts found that those same reactions are exhibited in roughly equal proportions by both truthful and deceptive examinees, including those with no knowledge of polygraph countermeasures. By keeping supposed countermeasure detection techniques secret, NCCA would prevent the kind of scrutiny that Honts was able to bring. That might save NCCA embarrassment, but it’s hard to see how that’s in the interest of America’s national security or public safety. NCCA also floats the idea of classifying the fact that a “particular US intelligence, counterintelligence or security programs use a specific type of polygraph technique.” This is a particularly bad idea. To the extent that polygraphs are administered to individuals without security clearances, for example, to job applicants, information about the polygraph techniques used by federal agencies cannot be kept secret. For example, AntiPolygraph.org knows, from examinee reporting, that the NSA and CIA persist in using the (thoroughly discredited) relevant/irrelevent technique for applicant screening (documented in Ch. 3 of The Lie Behind the Lie Detector), while DoD and DOE use the directed-lie Test for Espionage and Sabotage and federal law enforcement agencies use the probable-lie Law Enforcement Pre-Employment Test (PDF). This kind of information simply cannot be kept secret, and it’s pointless to try. In short, classifying polygraph training and research materials will simply serve to shield more bad science from critical review. The Office of Security’s Credibility Assessment Program helps to protect national security through the use of the polygraph examination. The polygraph vetting process is a critical element in protecting the safety and security of this Agency and the United States of America. We have seen examples of when examinees attempt to employ tactics designed to undermine the polygraph. Attempts are not likely to be successful due to sophisticated detection devices. Any attempt to undermine a polygraph exam will be viewed — regardless of motivation — as a threat to this Agency and national security. DIA employees or DIA-affiliated persons who engage in purposeful and deliberate tactics to alter the outcome of a polygraph examination will be the subject of administrative or disciplinary action. This can include suspension, loss of security clearance, or even removal from federal service. The same penalties may apply to any DIA or DIA-affiliated person who coaches or collaborates with others to deliberately undermine a polygraph examination. Contractors who undermine a polygraph examination place their livelihood in jeopardy. Bottom line: It is a dangerous game to play with your career and with the national security of the country you serve. Thank you for your cooperation and support of the Office of Security’s mission to protect the Agency’s people, property, and information. 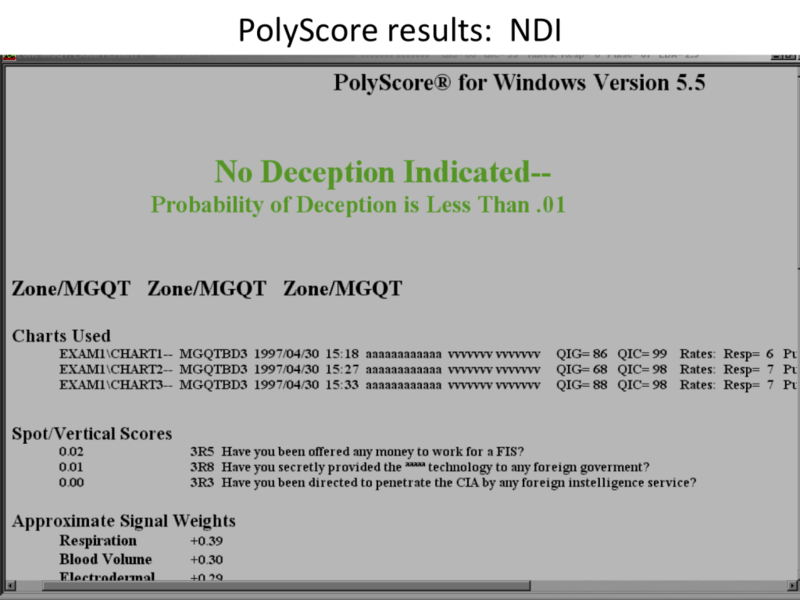 AntiPolygraph.org agrees with Norton that it is a dangerous game to play with national security. But it is DIA that is playing with national security by relying on scientifically baseless polygraph screening to assess the honesty and integrity of its employees. We note that Ana Belen Montes, the most notorious spy in DIA’s history, beat the polygraph. And in 2009, DIA fired analyst John Dullahan after a (wrongly) failed polygraph. We invite DIA employees, and all who may face polygraph screening, to educate themselves about this unreliable procedure and learn how to protect themselves against the risk of a false positive outcome. Our free book, The Lie Behind the Lie Detector (1 mb PDF) is a good place to start. 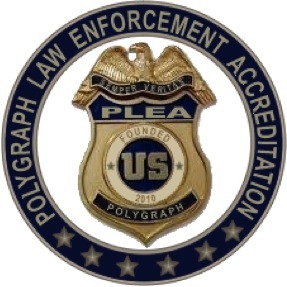 As the American Polygraph Association holds its annual seminar in Austin, Texas this week, one of the topics on the agenda is a program run by a consortium of federal, state, and local law enforcement agencies called “Polygraph Law Enforcement Accreditation” (PLEA). Participating agencies include the Customs and Border Patrol (CBP), the Defense Criminal Investigative Service (DCIS), the Los Angeles Police Department (LAPD), and the Houston Police Department. The PLEA consortium, whose motto is “Semper Veritas” (truth always), has promulgated a 65-page “Polygraph Guide for Standards and Practices” that sets forth procedures and protocols to be used by participating agencies. AntiPolygraph.org has received a copy of this guide, each page of which is marked “Law Enforcement Sensitive Information,” and has made it available for download here (1.9 MB PDF). Chapter 10 will be of special interest to applicants for employment with agencies participating in the PLEA consortium. The directive also reflects the re-naming of the Defense Academy for Credibility Assessment (DACA) the National Center for Credibility Assessment (NCCA). Hat tip to Cryptome.org, which mirrored this document on 5 February 2011.